Nadine Lustre shares details about her first solo film with director Irene Villamor. 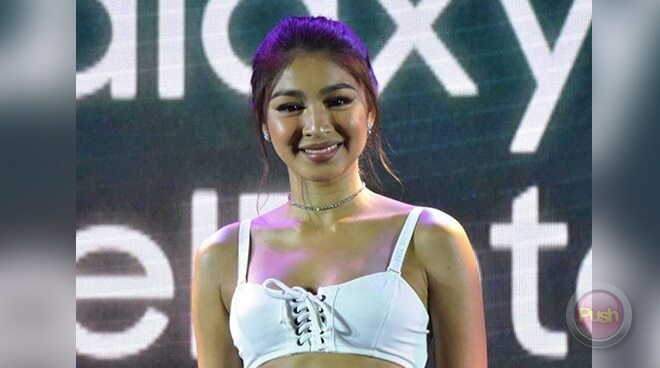 After the announcement that she would be playing the mythical Pinoy character Maria Makiling who will make a debut in James Reid’s movie Pedro Penduko before eventually having her own standalone film, Nadine Lustre admitted she is still processing the news just after arriving from the States this week. “Nasabi na sa akin a few months back so I’m really, really excited for that kasi for sure in the future they’re going to have bigger plans for Maria Makiling. Actually kasi since may jetlag pa ako hindi pa ako updated kung anong nangyari kahapon. But nakuwento nga sa akin ni James (Reid) na naitanong nga daw yung question na yan. I’m really, really excited for that. I’m really, really excited for that. It’s nice to be able to work on a film na Filipino folklore,” she shared during her Samsung Galaxy J6 launch held last June 16 at the SM Mall of Asia. Apart from Maria Makiling, Nadine is also preparing for her first solo movie Ulan which will be under Sid & Aya (Not A Love Story) director Irene Villamor. “I’m really, really excited for this one kasi this is more about finding yourself. Yung character ko dito she will undergo a lot. It’s about finding yourself and learning to love yourself. That’s pretty much always what I tell other people when they ask me na, ‘How do I get over a break up? Paano ako sasaya and all?’ It’s just simple. Just love yourself. I’m excited to work on this project. This is what I really stand for, self-love,” she said. Nadine said that people will definitely get a surprise when they find out who her love interest is in the film. “Meron. Secret muna (laughs). You’ll find out soon,” she added. Even though she and love team partner James are taking a break from doing television work, Nadine said they are still collaborating closely when it comes to their music projects. “Sa teleserye for now wala muna but we’ll be working on separate projects, separate films but definitely with music tuluy-tuloy pa rin yun na magkatrabaho kami,” she explained. The new Samasung Galaxy J6 celebrity ambassador also shared her diet and fitness routine that helps her cope with her busy showbiz schedule. “I just eat a lot of vegetables and less processed food. My workout is weightlifting, cardio everyday but not everyday heavy. Alternate siya,” she said.